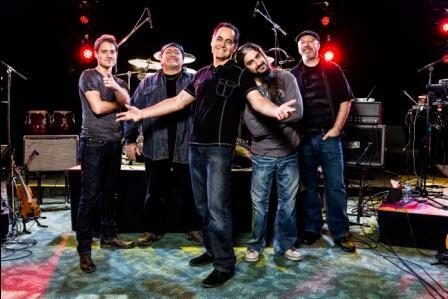 On the heels of a busy year that saw Neal Morse release albums and tour with prog rock supergroups Transatlantic and Flying Colors, as well as put on his own two day festival dubbed Morsefest, comes a new solo album that’s already a strong contender for prog rock album of the year. Written in the studio as a band effort (Morse usually writes out the material beforehand), the album skillfully merges the complex structures of progressive rock with the melodic sensibilities of pop to create music that has substance without falling into overindulgence. It may seem bizarre to claim that an album containing a 27-minute song along a 10-minute one avoids being overindulgent, but it does. The band eschews technical prowess for its own sake and the five talented musicians (Morse on guitar and vocals, Mike Portnoy on drums, Randy George on bass, Eric Gillette on guitar and Bill Hubauer on keyboards) effortlessly navigate the music’s twists and turns. The first track, “The Call” sets the tone with a skillful blend of prog and pop rock that twists and turns into many different sections. Like all good songs, it seems to fly by despite being 10 minutes long. The title track (and lead single) “The Grand Experiment” is the most “radio friendly” cut on the album. It’s a great rock song with great playing from a band firing on all cylinders. I feel the need to single out Mike Portnoy’s playing on this record, as the drummer turns in one of his best performances ever (and that’s saying something), not for its virtuosity but for its compositional skills. All over the album, the drum parts are an integral aspect of the arrangements, and he always plays the right thing to set the mood or move the songs forward. Fans will certainly want to pick up the deluxe edition that comes with 5 extra tracks. The 2 new compositions (“New Jerusalem (Freedom is Coming)” and “Doomsday Destiny”) are no mere throwaways and are just as good as the rest of the album. The third track, “MacArthur Park”, is the latest in a long line of covers from these guys. Originally recorded by actor Richard Harris (Harry Potter’s original Dumbledore), most people these days are probably more familiar with Donna Summer’s version, but Morse says the original version served as blueprint. The arrangement, by keyboard player Bill Hubauer, turns the song into another 10-minute prog rock extravaganza that allows the listener to overcome some of the cheesy lyrics. The last two tracks, “The Creation” and “Reunion”, were recorded live during last year’s MorseFest and offer fantastic interpretations of these songs from his “One” album. “The Grand Experiment” is a great album, with fantastic musicians and great songwriting. Fans of prog rock should love it. But fans of all kinds of rock would surely gain from listening. It’s top notch. Read my interview with Neal here, and my review of the Montreal concert here.